I volunteered to help Firecracker's Kindergarten class make pumpkin soup this year. 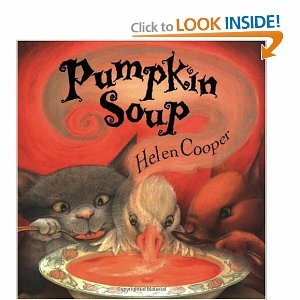 I heard about the book Pumpkin Soup by Helen Cooper from Christianne on Little Lage Turners last year. 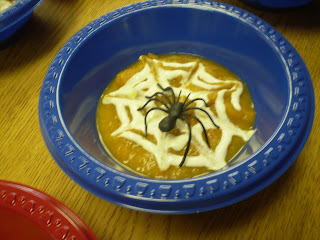 Last year, my kids loved the book and LOVED the idea of making pumpkin soup...but although Hubby and I thought the soup was delicious, the spices were a bit too adventurous for our kiddos. 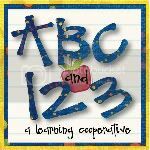 Firecracker's kindergarten teacher and I agreed that it would be good to expose the kids to foods they might not like just for the experience...but I wanted to find something kindergarteners would be more likely to try and like, so I went searching for a new pumpkin soup recipe. Let me tell you...there are plenty of pumpkin soup recipes out there...and most of them looked a bit too adventurous for the typical kindergartener. However, I found this one and then adapted it a bit more. We tried it out at home ahead of time. 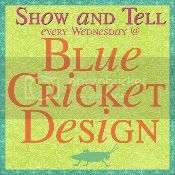 Firecracker was still not a huge fan, but everyone else liked it, so I decided we'd try this recipe with her class. We had to modify it a bit to make it work to make in the classroom in a crock pot and using canned pumpkin. This recipe is approximately doubled from the original, but I reduced the broth, so this is more the consitency of chowder which I figured was better for reducing kindergartener spills. You can add more broth if you want to make it thinner if you prefer. I sauted the onions, pepper, and potatoes at home before bringing them to the school. Then we broke the recipe into halfs to get it to fit into the blender and that way there were twice as many jobs. We were able to have each of 19 kindergarteners do a job...which was important since the friends in the book each have a special job for making the soup. Then the soup cooked in the crock pot in the room. Because I knew there was a good chance that some of the kindergarteners would not want to try the pumpkin soup, we also made breadsticks with them. 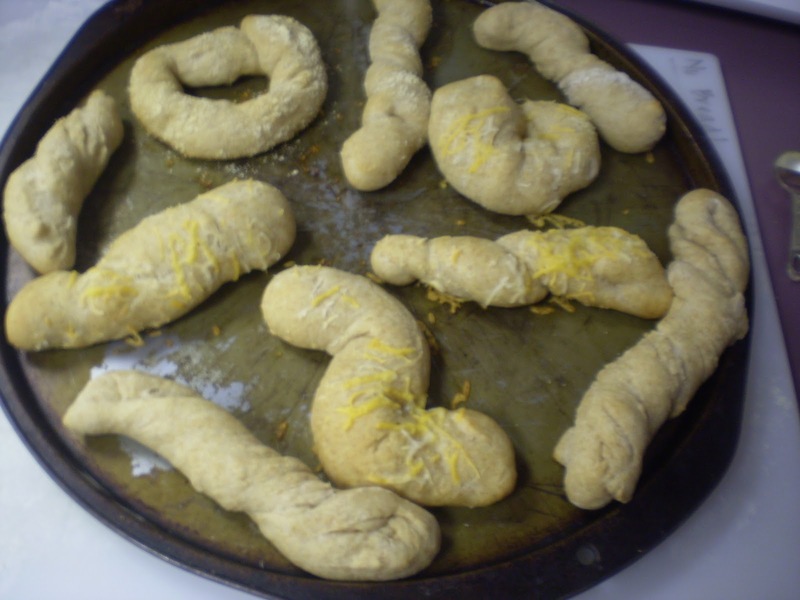 I made and rolled out the dough at home (about a 1 minute drive), and then each kindergartener got to twist and shape their own bread stick and choose between garlic powder, parmesian cheese, or regular cheese for the top. I took them home and baked them while the soup was heating up and the kids went to their special interest class. Lucky for us Grandma and Grandpa happened to be in town for the day and Grandma came to help too. She did a great job keeping track of the breadsticks so that each child got their own back after baking. Then to top off the fun, we made souper easy sour cream spider webs and added plastic spider webs to them. 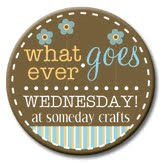 Not only did this go with Halloween, but it matched their "S Chant" that goes something like, "S says "ssss." Spider in the soup. S S S!" (I think it's part of the "Read Well" program.) The kids thought it was fun. Heat oil in pan and saute onions until they are soft. Add the potatoes and red bell pepper and cook for about 10 minutes. Put sauted potatoes, bell pepper, and onion in blender and add water/bouillon or broth. Puree well in blender and pour into crock pot. At ground pepper, salt, and sugar to taste. Heat in crock pot on high for an hour or two until heated through, or cook on low for a longer period of time. Serve with dollops of sour cream and/or bread sticks. oh this looks yummy and i love that you added breadsticks. i'd like to see if my guys would try it, too.